Park Home Assist values all current and potential customers, and we believe it is important to build strong relationships with our clients. During the festive period we were approached by Pat Purdey, Treasurer at the Grange Farm Residents Association, to get involved with their Christmas Raffle. On 14th December 2015 Claire Leech, Director at Park Home Assist, visited the park with a bespoke hamper which was to be given out as the first prize in the raffle. Residents also received a ‘Christmas Goodie Bag’ from Park Home Assist. Park Home Assist is always interested in getting involved with Park Resident Associations, so please do not hesitate to contact us. 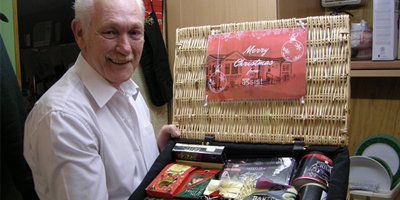 John, winner of the 1st Prize Christmas Raffle at the Grange Farm Residents Association.